Agastache barberi Tutti Frutti will put on a great show from late Spring through Summer. The early season with these pink bracts is followed by lavender flowers. The Hummingbird Mint is true to its name, the hummingbirds go nuts for it. Agastache Tutti Frutti requires regular water and well drained soils. Unfortunately this is a not so common combination in Southern California. Agastache Tutti Frutti is a good plant for containers with its long blooming period. The Hummingbird Mint will grow to 3 feet. Once the blooming season is completed I cut Agastache Tutti Frutti off below the lowest blooming stalk. That is usually pretty close to the ground. Agastache Tutti Frutti is hardy to Winter temperatures far below what we are likely to see. Side view Flowers and foliage of Agastache barberi Tutti Frutti the Tutti Frutti Hummingbird Mint. 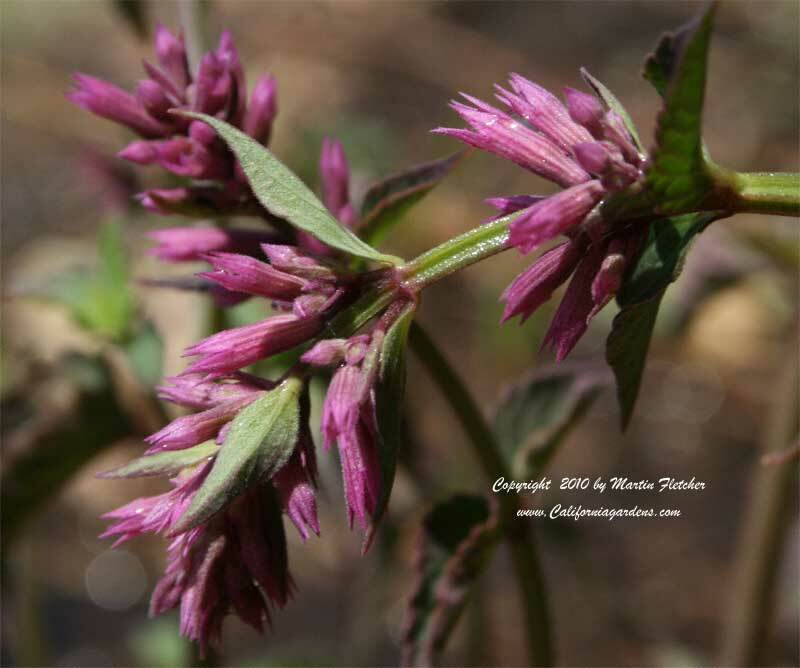 High resolution photos are part of our garden image collection.